We specialize in getting ALL the details from one database format into another. So you don't have to re-enter any data. We can export the data from any Q&A database in to popular programs such as Microsoft Access, Excel, ACT!, Goldmine, and Salesforce.com. Just send send us the database, we perform the conversion, then send you the finished file. Please remember that each Q&A database consists of a two files that work as a pair, the .DTF plus the .IDX file. We make Memo or Notes fields for the lengthy text passages at no additional charge. Basic conversion converts all Q&A database fields as the same data type. These types are Text, Number, Date, and Yes/No fields. You will need to provide us with the administrative UserID and Password so we can open the file and do the conversion. For an additional charge, we will perform a thorough pre-conversion evaluation of your Q&A database. This will expose any potential "problem" areas that might adversely affect the conversion result, such as corruption in the database or expanded fields containing lengthy text values like notes or comments that require special handling. During our post-conversion check, we sample the records in the converted database and compare them with the same records in the Q&A database to ensure that the conversion process correctly transferred the data. 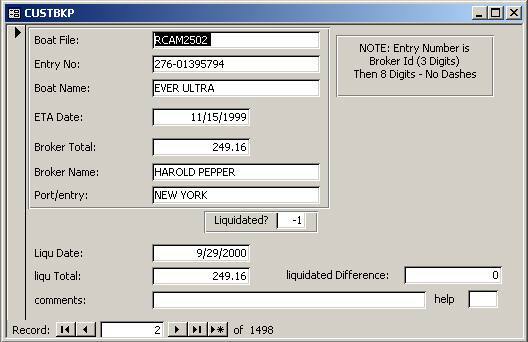 For conversions to Access 2000, we can usually retain your original Q&A database's field names in the converted database. (Q&A supports lengthy field names that can contain spaces.) There is no additional charge for this. A field such as "First Name" would become "First_Name" for example. Many conversions from Q&A are relatively simple. 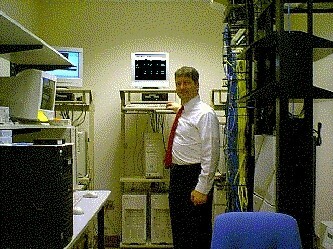 But we have done hundreds of them and can handle the toughest data conversions. One of the challenges of a Q&A conversion comes from the fact that Q&A is so flexible in how it stores data. In some ways, this 1984 program has more capabilities than the most modern Microsoft Access! For example, while Access is limited to 254 fields per record, Q&A can have 16000 fields! While Access requires a unique field name, Q&A can re-use the same name, and even no name at all for a field! However Q&A is an old, flat-file database, that is not truly relational. So the advantages of converting outweigh its features. That's why Q&A is no longer in business and why most people use Access. So we have developed procedures to split up the data in to multiple tables, which is actually better organized. Often, a Q&A had so many fields (columns) which really should be records (rows). So you will end up with a much better designed, relational database, that allows you to do more with the data. Our fees are based on the number of records in your database. We will give you an estimate in advance. We accept checks either sent by overnight, or via check services like www.Qhex.com. We can also accept major credit cards from repeat customers. 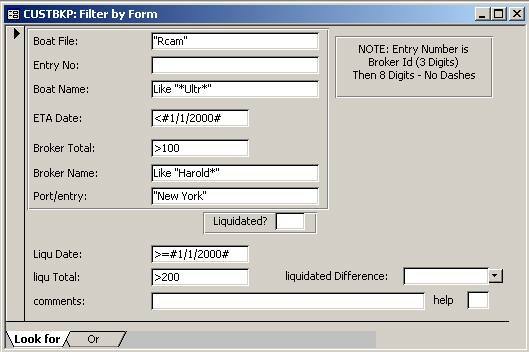 For each database, tell us how many forms (records) are in it. Let us know how many fields (categories of information like First name, Zip code, etc.) These affect the price. 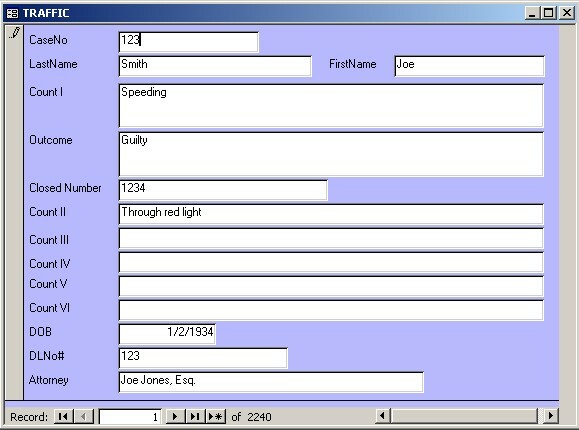 For an additional charge, we can also design a Data Entry/Record Search form for your new database that looks and works like the form in your Q&A database. 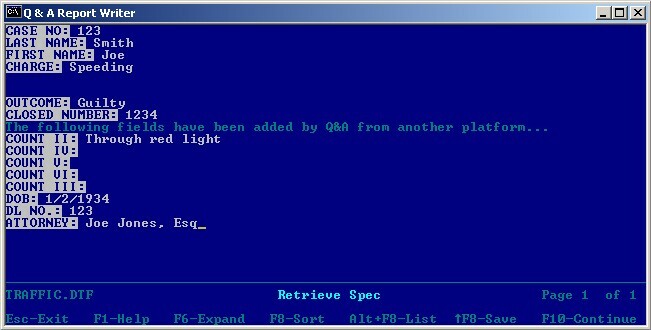 Q&A for Windows databases can contain multiple forms, such as a Master form, a Main Menu form, an input form and one or more search forms. The database might also contain scripts which link the forms into a kind of application. 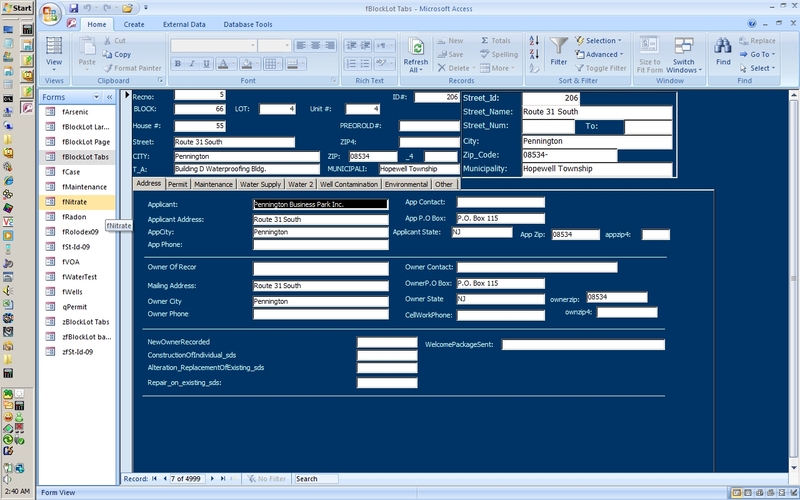 If you have a Q&A for Windows application like this, we can re-create it in Access for you at an additional charge. 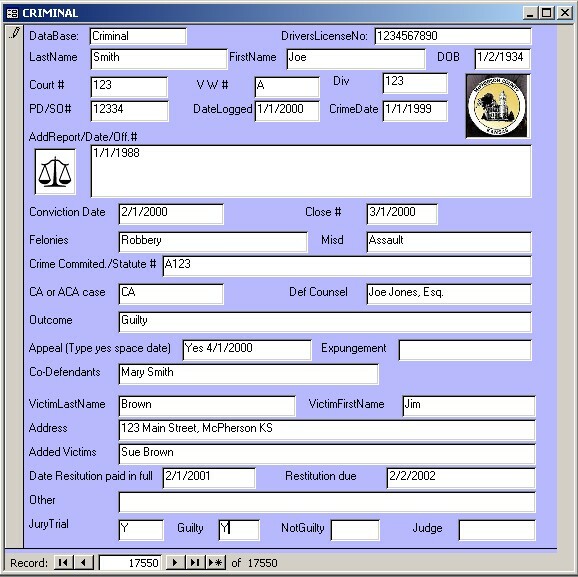 Special field qualities such as formatting, field validation, initial values, reports, programming, field restrictions, and lookups would be an additional charge..
Reports and database customization features such as Programming, Saved Specs, Restrict Values, Initial Values, Field Templates, and Speedy Fields can also be done for an additional charge. If you have been having problems with the database such as missing data, reports that won't run, intermittent or regular error messages when performing certain operations, or the like, you must inform us in advance. We would have the same experience, and may be able to fix the database first, for an additional charge. We must actually see the Q&A database in order to fully evaluate it and give you a firm quote. The prepaid charge for this pre-conversion evaluation is $60 for up to three databases as it does take our time from other projects to do so. If you then have us perform the work, the pre-conversion evaluation charge will be deducted from our overall charges. 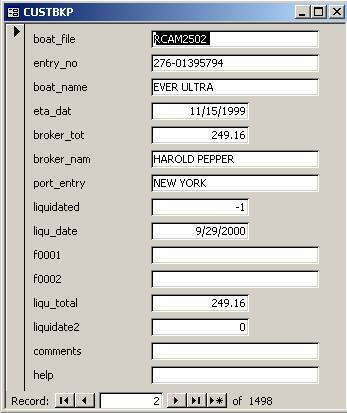 BOAT NAME contains the characters "Ultra"
BROKER NAME starts with "Harold"
Also for custom reports, we can create Microsoft Access based custom reports on an hourly basis. The cost depends on the number of details needed to reproduce the report. With Q&A, because there is basically one table per database, you were limited in your database design. If you had customers and wanted enter a history of correspondence (for example), you had to create a large text field, or add additional fields to record what you said. If these got filled, up, you would go to File Design and add an additional field. This makes if very hard to search the data later for what was said on a particular date. A better way of designing this would be to use two tables: the CUSTOMER table, and the HISTORY table. They would be connected by a common field, the CustomerNumber. You can add as many records to the History table as you wish. Some customers may have no history yet, and some may have hundreds. 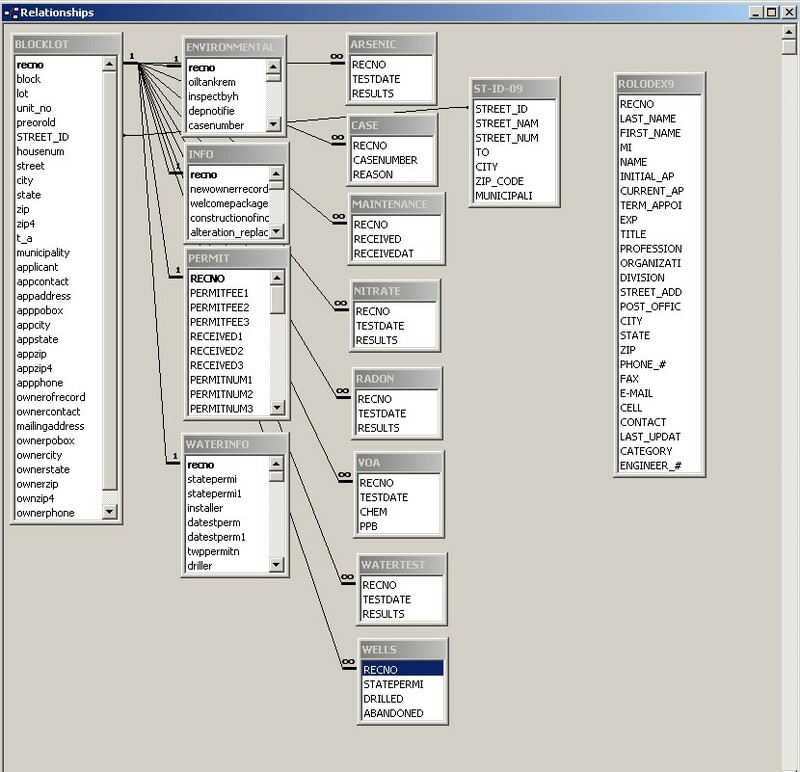 This is a more efficient way of designing your database, called a Relation design. The two tables relate to each other, based on a key field. We can convert your "old style" design to a Relational Database design. The cost for this varies, depending on what needs to be done. We will provide you an estimate before hand. We converted a Q&A database to Access for the Hopewell Township in New Jersey. This was a challenging project because their Q&A database had over 1000 fields. We organized them in to 15 tables so they could fit the 254 field per table limitation of Microsoft Access. 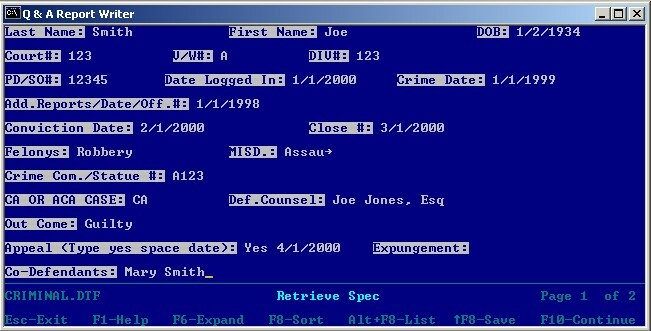 This also made the database more organized and relational. After converting the database, our instructor went to their office in New Jersey to give the staff training on the new system. 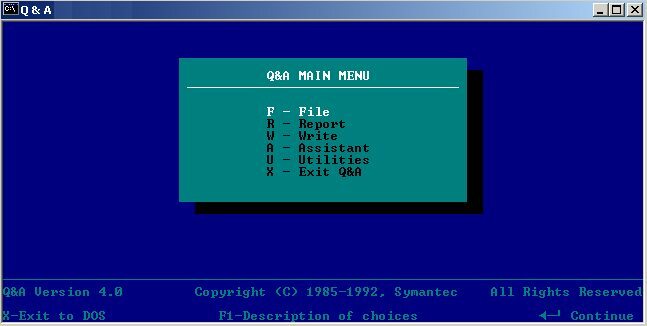 Why is Q&A no longer supported by Symantec? 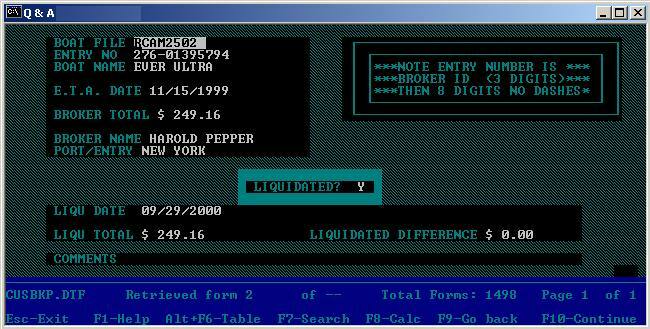 Q&A was ahead of its time, far exceeding the ease of use of its competitor at the time, dBase II and III. 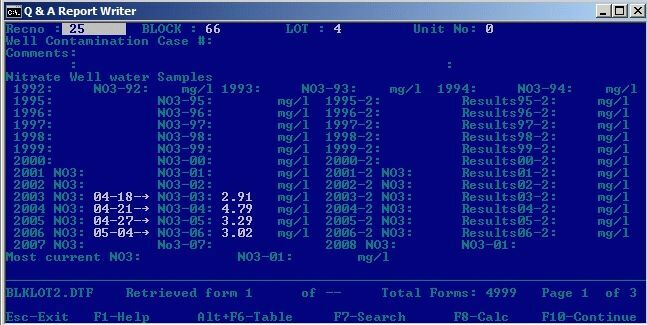 Even after over 10 years, it can accommodate more characters per text field than any other database product on the market, and more fields per record. It has one of the only English language search functions available. 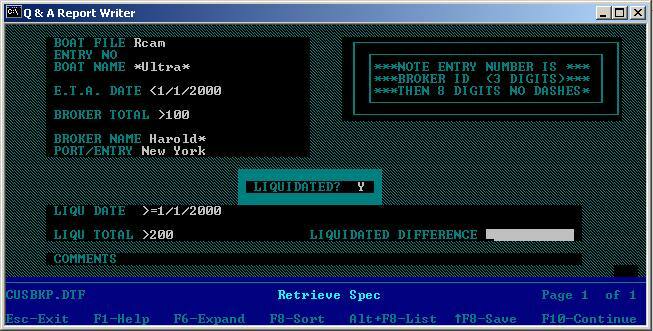 But when Microsoft came out with FoxPro and Access, it took most of the database market away. Symantec decided to focus all its energies on the up-and-coming computer security market, offering some of the best Anti-Hacking, Anti-Spam, Anti-Spyware, and Anti-Virus utilities. But we will still support it, or help you switch to a software that is supported by its manufacturer. What should you convert to?